Members: The letter below was mailed to all Messiah Lutheran Church members and active participants on February 26. 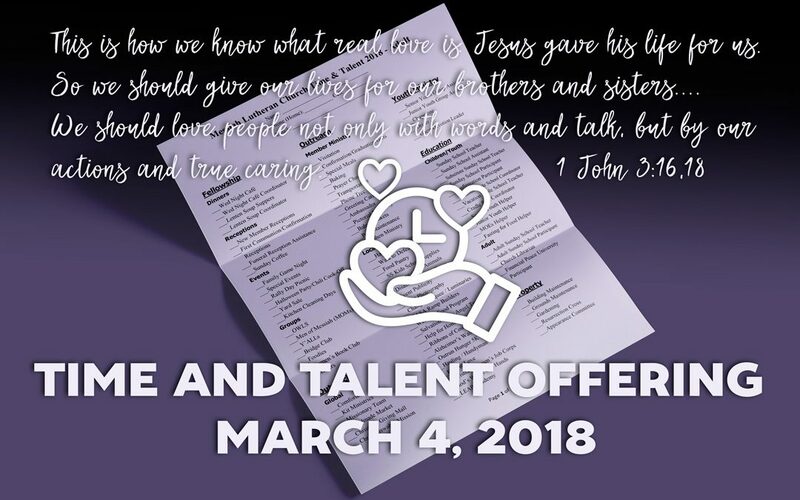 Since it is uncertain that our bulk mailing will arrive in time for members to bring it to Sunday Worship on March 4th, Heather Neely’s letter and links to downloadable copies of the Time and Talent Forms are at the bottom of this post. They will also be available at the Welcome Center in the Narthex on Wednesday, February 28th. This year, Ash Wednesday fell on Valentine’s Day. It is remarkably apt that a holiday centered on loved ones comes at the same time the church focuses on God’s love for us, shown through the sacrifice of His son, Jesus Christ. Lent is a season devoted to honoring this sacrifice, which seems an appropriate time to talk about the many ways that you are able to offer your time through Messiah Lutheran Church. I am grateful to be able to give back to God through MLC and the wide variety of activities our church supports. One way that I share my time is in helping with the Time and Talent drive. Messiah annually asks members to fill out a Time and Talent survey as a way to see wherein lie our interests and spiritual gifts (talents from the Holy Spirit) to use for God’s glory. This helps our ministry leaders connect you with the church activities or groups which you find most interesting or fulfilling. In this mailing are Time and Talent surveys for adult members. Children/Youth forms (as well as additional adult forms) are available at the church Welcome Center in the narthex, or in the church office and also online at mlutheran.org Brochures with descriptions of each item are also available at the Welcome Center. Please take time to mark those ministries where you are called to serve. Also, there is a space at the end of the form for listing other skills or talents you have to share. Whatever your gift, God has ways of using it. If you have questions about a particular item, email me at stewardship_rep@mlutheran.org or call me. Please complete a form even if you have already done so in a previous year. This is especially important this year, as we have upgraded our church software, and previous time and talent information could not be transferred. The forms will be received during the offering at the March 4th services of worship, or you may return them to the church office. I am constantly amazed by simply how much goes on at Messiah Lutheran. It is uplifting to me to be a part of this effort, and I hope you all have felt the same way. Thank you for sharing the gifts God has entrusted to you.